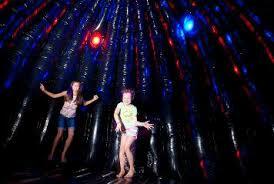 Give your guests a place to dance, play their favorite music, AND bounce around with this Inflatable Dance Hall! 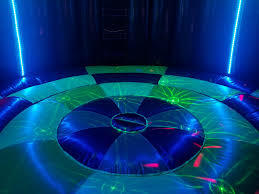 This unique dance hall offers party lights, a bluetooth speaker, and plenty of room to dance and bounce around--all in the privacy of an enclosed inflatable. Nevermind clearing a whole room for a makeshift dance floor, let your guests dance their hearts out in this Inflatable Dance Hall. Sure to be a hit at your next birthday party or event! Got Bounce? The Bouncing Buddies Inflatable Dance Hall with Lights and Music is great for family entertainment, providing the most popular form of amusement for children. Bouncing also puts you in a state of health and fitness, improves your sense of balance, creates an aerobic effect for your heart, strengthens your muscles, and increases the capacity for respiration, resulting in better mental performance!